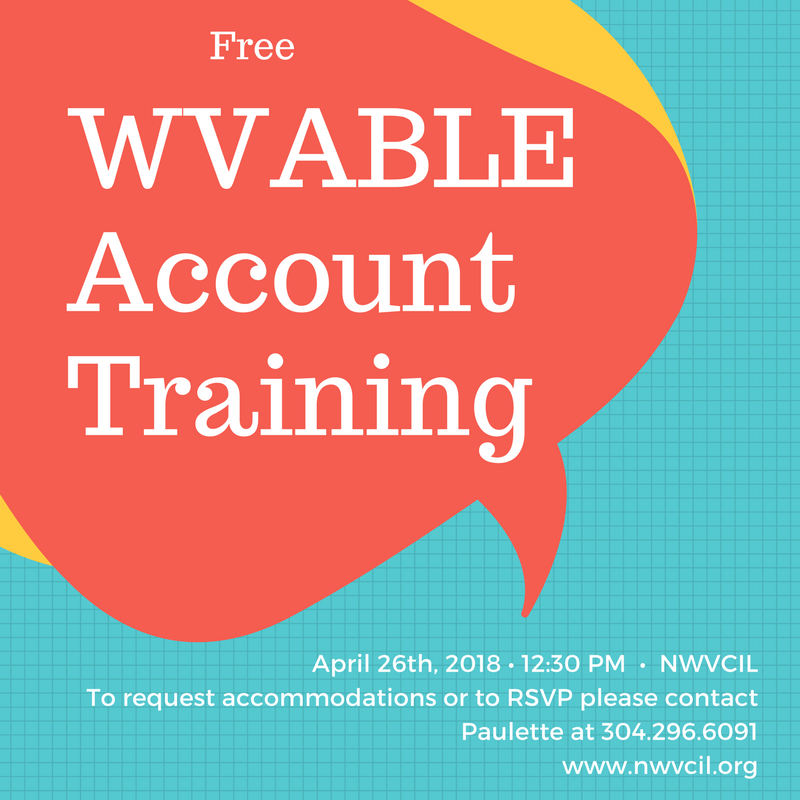 CORRECTION: Free informational session about WVABLE accounts, including information about the application process will be held on April 26th, at 12:30 PM. We need help getting additional Senators to sign a letter opposing H.R. 620 or any notice and cure effort in the Senate. Those groups supporting H.R. 620 or bills that would create a notice and cure provision for the ADA have started an effort to dissuade Senate offices from signing on to the Sen. Duckworth-led letter opposing H.R. 620 or any notice and cure bill being brought before the Senate. We need at least seven more offices to sign onto the letter. Calls, e-mails, and visits from state constituents to the Senate offices below asking their Senator to sign onto the Duckworth letter are needed. The groups that support H.R. 620 and notice and cure provisions are mustering their forces. It is time to put pressure on these additional offices to sign onto the Sen. Duckworth letter. A copy of the letter being led by Sen. Duckworth is also below. If you have questions, please ask. Now that the supporters of notice and cure have started to push back it is important to have the voices protecting the ADA to be heard loud and clear in the Senate. Thank you for your help! We are writing to express our strong opposition to H.R. 620 the ADA Education and Reform Act and any legislation that would repeal or weaken rights under title III of the Americans with Disabilities Act (ADA), which prohibits discrimination on the basis of a disability in certain places of public accommodation. As a civil rights law, title III of the ADA was modeled after title II of the Civil Rights Act of 1964, which prohibits discrimination on the basis of race, religion, and national origin in certain places of public accommodation. Title III of the ADA does not permit monetary relief in the form of damages or settlements. Similar to title II of the Civil Rights Act of 1964, the ADA only permits non-monetary injunctive relief and recoupment of reasonable attorney’s fees for individuals who prevail in a suit to enforce their rights under title III and secure removal of architectural barriers in public accommodations where readily achievable. Congress carefully crafted title III of the ADA to make sure private enforcement actions prioritize achieving readily accessible barrier removal and are an affordable avenue for Americans with disabilities to seek relief. The expectation was that businesses would make themselves accessible before people with disabilities showed up at their place of business, rather than waiting until receiving a notice that people with disabilities have been excluded before starting to think about complying with the law. The ADA is a groundbreaking civil rights law that recognizes the reality that removing an architectural barrier, when readily achievable, is a proven, efficient solution to improving accessibility in public places and providing equal treatment of people with disabilities across the United States. In recognizing the importance of accessibility, Congress also established tax incentives for businesses to lower the cost of making a place of public accommodation more accessible pursuant to ADA guidelines and requirements for architectural barrier removal. Proponents of H.R. 620 assert that eliminating the right of Americans to seek immediate injunctive relief under title III of the ADA is necessary to address private lawsuits that threaten businesses with punitive damages and demand monetary settlements. However, these private actions seeking damages are filed pursuant to specific State laws that unlike Title III of the ADA, authorize monetary damages. H.R. 620 would make no change to those state laws and therefore fails to address lawsuits seeking damages. However, it would destroy any incentive under the ADA for timely removal of architectural barriers in public accommodations. Because Title III of the ADA does not provide for damages, a business would have no reason to comply with the law unless and until it received written notice from a person with a disability who had been harmed, informing the business that it had violated the law, and the business would then have four months to remove the barrier or make “substantial progress” in doing so. There would be no consequence for breaking the law until the notice was received and the waiting period expired. When supporters of the discriminatory H.R. 620 argue for its necessity by citing examples of alleged minor accessibility infractions, they miss the point that this bill undermines the rights of people with disabilities, rather than protects them. They also reveal a callous lack of empathy and understanding for the accessibility challenges Americans with disabilities face every day. There is nothing minor about a combat Veteran with a disability having to suffer the indignity of being unable to independently access a restaurant in the country they were willing to defend abroad. There is nothing minor about a child with cerebral palsy being forced to suffer the humiliation of being unable to access a movie theater alongside her friends. Simply put, we reject in the strongest terms the offensive suggestion by supporters of H.R. 620 that a civil rights violation denying access to a public space could ever be “minor.” A ramp a few degrees too steep or a shower head a couple inches too high from the legally prescribed standards are the difference between accessibility and discrimination. To efficiently address the aforementioned examples, we would urge operators of public facilities to simply fix the problem by lowering the ramp a few degrees or lowering the shower head a couple inches. This will not only make sure entities comply with the law, but more importantly, providing accessibility will protect the health, safety and dignity of Americans with disabilities, as promised under a civil rights law passed nearly 28 years ago. Congress should promote ADA compliance nationwide by improving existing tools and resources, rather than advancing a harmful and duplicative proposal such as H.R. 620, which would upend a carefully crafted legal framework that has boasted strong bipartisan support for nearly three decades. It would be more productive to enhance funding for existing ADA education and mediation programs rather than requiring lengthy notice periods that remove any incentive to follow the law until violations are detected and civil rights are denied. We are ready to work with any Senator who is interested in developing pragmatic and bipartisan solutions that improve business’ compliance with the ADA. For example, we support strengthening the capabilities of the DOJ Civil Rights Division’s ADA Technical Assistance Unit, which provides education and technical assistance to help businesses comply with the law. We should also expand the ADA National Network, which supports ten regional ADA Centers and an ADA Knowledge Translation Center. These resources, funded through the U.S. Department of Health and Human Service’s National Institute on Disability, Independent Living, and Rehabilitation Research, provide free assistance to entities seeking to comply with the ADA. However, we will strongly object to any time agreement or unanimous consent request with respect to consideration of H.R. 620, or any similar legislation that seeks to weaken Federal protections for an entire protected class of Americans. By preserving title III of the ADA, Congress will uphold the intent and principle of the underlying statute that disability rights are civil rights. No American should be forced to endure discrimination for any length of time so that places of public accommodation may learn how to follow a seminal, bipartisan civil rights law that was enacted in 1990. Respectfully, we urge you all to join us in supporting the rights of Americans with disabilities by making clear that H.R. 620, or similar legislation, will never receive a vote in the United States Senate during the 115th Congress.